Or once a quarter, or even once a year? Or you want to finish something by a certain date, but you don't necessarily need to start it immediately? Most Beeminder goals are things people want to do pretty often (daily or weekly), but these sorts of " chunky goals" are not a problem for Beeminder either! When creating the goal, make sure to tick the box to "start with extra leeway" and set your goal rate accordingly. Let's say I want to make a goal to attend one conference per quarter, but my next scheduled one isn't for another two months. 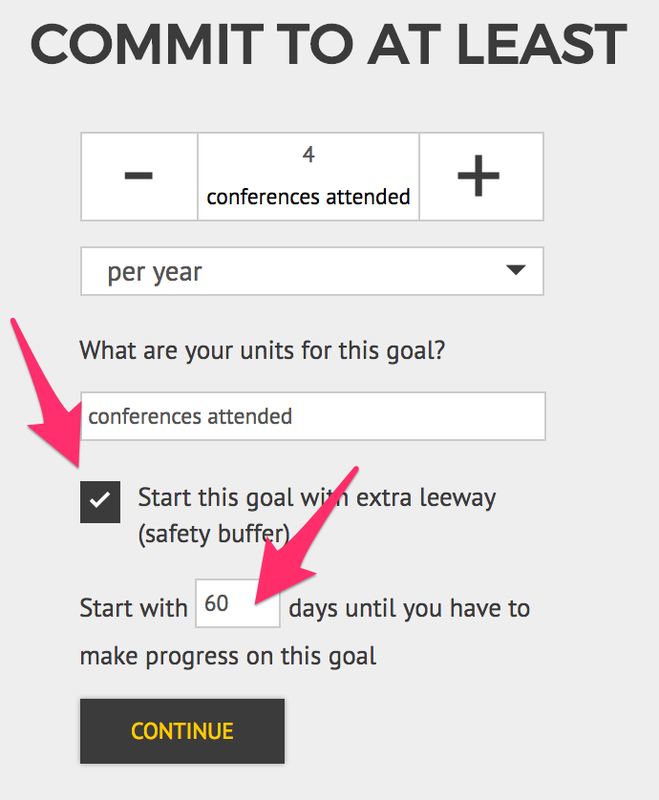 I'd make a Beeminder goal to attend 4 conferences per year and start my goal with 60 days of leeway. That gives me some safety buffer, so my goal won't derail before I can attend my first conference. After I attend it, I enter a 1 to my goal, and Beeminder will start counting down about 90 more days before I need to attend my second!